Getting your ESS in Shape is important for your health, quality of life and longevity, so get moving. Regular exercise is an important part of self-care and nobody can do it for you. Exercise keeps our minds and bodies healthy. You can do this at any level and any age to make the fitness part of self-care fun and exciting. If you are not currently exercising, are you waiting to be forced into it by a crisis? If you are already exercising, take it to the next level and Get Your ESS in Shape. Your ESS is made up of your: Endurance, Strength, Structure. Life is a marathon one sprint at a time. Based on your current habits and health, would you trust your body to take you on a long-distance trek in an emergency? If you had to count on your body to save a loved one, would you be able to? If you had to run away to escape danger, could you? Your endurance is important for all these activities, and it is important for longevity. If you have good endurance, you will enjoy a great sense of stamina and activity now and while you age. Your energy will be high and you will feel like doing things. You will not be left home alone while your partner goes off to experience the world. You can increase your stamina through cardiovascular, aerobic, exercise that strengthens your heart, burns calories, and increases your energy. Running, cycling, swimming, and power walking are just a few examples of types of exercise that will increase your endurance. Endurance training is very important to keep your heart and lungs healthy, eliminate stress, and strengthen your immune system. Always exercise with a heart monitor to maximize your results and achieve your goals, while also ensuring that you exercise safely within the normal ranges for your age. Strength training is also important for healthy aging because you are going to want and need strong muscles to keep you confident and maintain your independence as you age. We’ve all seen an older person struggle to get out of a chair. If you have good strength, you are more likely to remain self-sufficient and independent. Strength training can be done through weights, yoga, and Pilates. When you set goals for strength training and continually strive to achieve them, you will be excited to see that your strength can increase as you age. Your muscles can stay strong and defined. The sagging skin and muscles often come from not keeping your body toned through strength-training exercise. If you are already an experienced strength trainer and have a routine, shake it up a little bit. Try increasing your weight by 10 percent to 20 percent. Get somebody to spot you if necessary and try to squeeze out a few more reps. Vary your exercises on each body part. Personal Trainers and many of the neighborhood fitness centers and chains, like CrossFit, have become extremely popular because they set up your routines and vary them for you. Work out with a partner and challenge each other. You will begin to see a better result. Always maintain good posture when you strength train to ensure that your form is good and your spine stays healthy during your training. In countries where longevity is much higher than the U.S., good posture and a healthy spine are a very high priority. Your structure includes your body shape and physical frame. Keeping your structure aligned and balanced will keep you looking good and help to prevent injuries while you exercise. This will also help insure that your nervous system stays healthy whick will keep you healthier on every level. How is your structure now? Have you measured yourself lately and set goals for your structure so that it is in the shape you desire over your lifetime? You can measure your structure with your eyes at first and decide how you want to change your shape, or get a tape measure and record your specific measurements. This will give you a starting point for goals that you want to set. Another important way to evaluate your structure is through a posture test. Stand in front of a full length mirror with your eyes closed. March in place for five seconds, stop, hold still and open your eyes. Is your head tilted to one side? Are your shoulders and hips level? Are your feet straight, turned in or pointed out? Are you hunchback or swayback? If you are unbalanced, you will be putting unnecessary strain on your structure, spine and nervous system when you exercise and run the risk of injury to your structure and nervous system. Don’t wait for a crisis to force you to take action. Now is the time for a chiropractic checkup.You are way overdue for a chiropractic check-up. Neurology comes first! 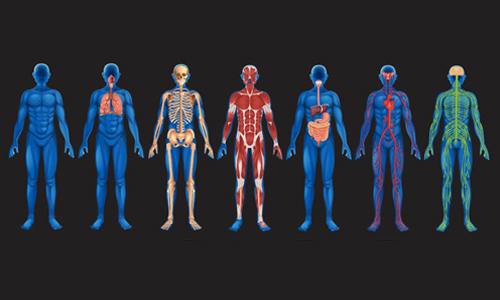 Your nervous system controls and coordinates all of your body functions including your muscles, organs and systems. You must have a healthy nervous system for your heart to beat, your lungs to breathe and your balance to be stable. This is why many of the top athletes and performers in the world utilize chiropractic care as a central part of their fitness program. Your nutritional habits will fuel your life. Consuming a diet filled with organic fruits and vegetables, lean proteins, very low in sugar and processed foods, should be the way you eat as a lifestyle. Isn’t it time you get off the weight loss roller coaster, cleanse, and make healthy eating a daily habit? This will sustain you not just while getting into shape but will keep you healthier as you age. We’ve all heard the expression “if you don’t use it, you lose it.” This is absolutely true with your fitness. It’s time to get your ESS in shape and live your ideal 100 Year Lifestyle.